Temperatures could drop as low as 15 degrees below zero. Collegian file photo. Butler University has not delayed or cancelled school despite expected record-breaking cold temperatures. 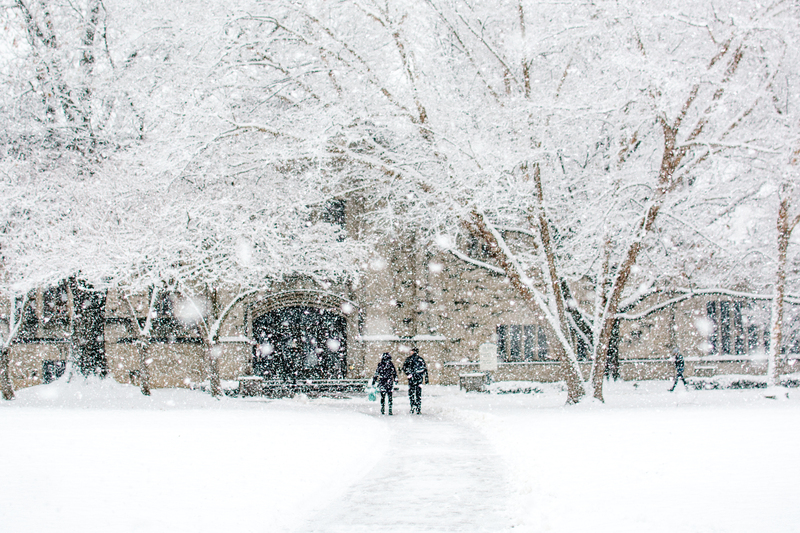 Campus tours and True Blue visits, though, are cancelled Jan. 30-31. The National Weather Service called for dangerously cold weather moving into central Indiana between Jan. 28 until Jan. 31. with temperatures dipping as low as 15 degrees below zero. Wind chills are expected to be as cold as 40 degrees below zero. In these temperatures, exposed skin can get frostbite in 10 to 30 minutes. Butler University issued a Dawg Alert at 1:22 p.m. notifying students that classes will reopen Thursday at 12 p.m. All classes before noon are cancelled, but classes after noon will continue as usual. Another Dawg Alert at 1:26 p.m. said essential employees are expected to work as scheduled. Other workers will report at 12 p.m.
Butler University issued a Dawg Alert at 2 p.m. notifying students that campus will be closed on Wednesday. Only essential employees should report to campus. The Butler men’s basketball game against Marquette is still scheduled to be played. Tip off is at 6:30 p.m. Updates on operation hours for dining halls is expected soon. IUPUI and the University of Indianapolis have joined Notre Dame and Ball State among Indiana universities that have cancelled classes for Jan. 30. UIndy’s campus will remain closed for non-essential personnel through 10 a.m. on Jan. 31. Ball State University announced classes are cancelled from 7 a.m. Jan. 30 through 11 a.m. Jan. 31. Chris Potts, associate director of admissions, said the decision whether to delay or cancel school Jan. 30 will be made by 5 p.m. A conference call with the university weather team is set for this afternoon. “Effectively, admissions will be closed to visitors Wednesday and Thursday,” Potts said, but admissions does not include the university. Students may or may not be notified if campus remains open. Potts said he and others have been pushing for an announcement either way. Students have started a petition on Change.org to close school until Jan. 30. There are now more than 1,462 signatures. “The only thing I want frozen is my tuition,” one person commented online. Petitions have also started for Purdue University, Indiana University and IUPUI. The decision to delay or cancel school is decided by the university weather team. The team is chaired by BUPD Chief John Conley and consists of the university’s vice presidents, arts and athletic directors, human resources and facilities. They began to discuss Jan. 28, and met again Jan. 29. These discussions could take place as early as 4:30 a.m. with a conference call at 5 a.m.
“We take the safety of our students and staff seriously,” Conley said in an email. The team discusses any factors that need to be considered, such as road and sidewalk conditions. A possible delay is dependent on whether the temperature will change enough within two hours to make a difference. The decision is made independent of other schools in the metro area, who considers different factors like children standing at bus stops. The University of Notre Dame announced they will close on 7 p.m. Jan. 29 through 1 p.m. Jan. 31. Purdue University College of Technology, a satellite Purdue University campus in northern Indiana, is also closed. An updated list of schools and businesses closed can be found here. According to the National Weather Service, today’s high is 16 degrees with a wind chill of 8 degrees below zero. The low for the night is 10 degrees below zero with a wind chill of 26 degrees below zero. Butler University Human Resources and Public Safety sent an email detailing extreme cold weather precautions. The email recommended to cover exposed skin, dress in layers, avoid sweating and stay dry, hydrate and wear winter gear such as a hat, knit mask and thermal underwear. The Department of Public Safety sends messages to share general safety information reminders. Students took to social media, posting screenshots of the email.